Left to right: Co-moderators Mike Collins and Qcitymetro.com's Glenn Burkins, Mayor Vi Lyles, District Attorney Spencer Merriweather, City Manager Marcus Jones, and Police Chief Kerr Putney. (clockwise from top left) Kerr Putney, Chief of the Charlotte-Mecklenburg Police Department; Vi Lyles, Mayor of Charlotte; Marcus Jones, Charlotte City Manager; and Spencer Merriweather, Mecklenburg County District Attorney join us for a special Public Conversation. 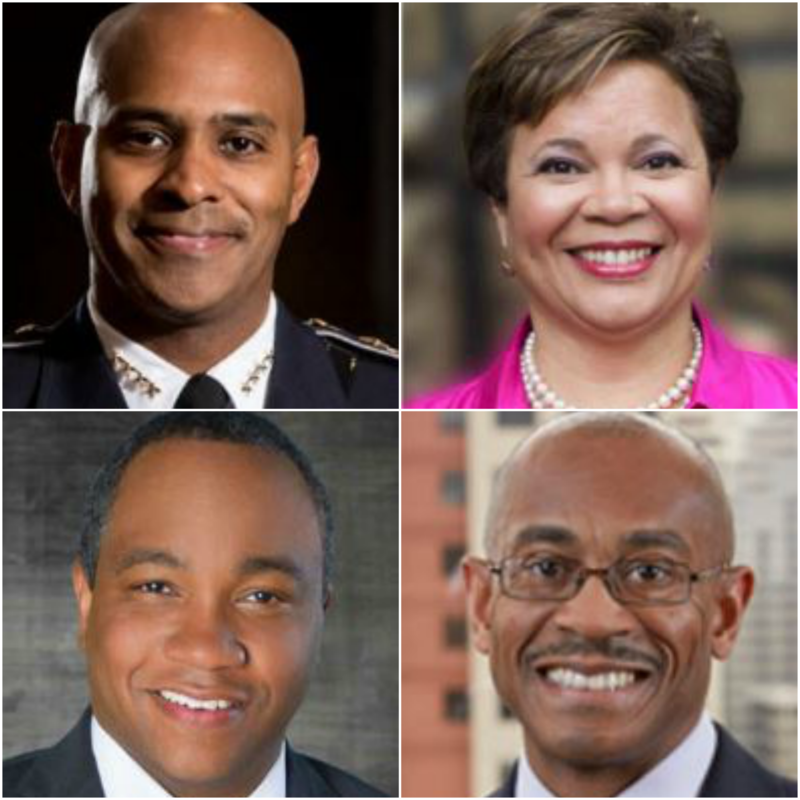 We are in a unique moment: Many of Charlotte’s top leaders are African-American. We talk with some of them - Mayor Vi Lyles, Police Chief Kerr Putney, DA Spencer Merriweather, and City Manager Marcus Jones in a special WFAE Public Conversation - "Building An Inclusive City." This event was broadcast live from Spirit Square's McGlohon Theatre on February 21. It will air on WFAE's Charlotte Talks on Tuesday, February 27 at 9am and 9pm. Charlotte finds itself in a unique moment: Many of its top political and civic leaders are African-American. The city’s first African-American female mayor was elected last fall, a year after the first African-American city manager was hired. The first African-American district attorney was sworn in this winter, and African-Americans also lead the police department, school board, transit system and planning department. At a time when many of the city’s biggest problems center on inequities along racial lines, it seems like an historic opportunity. We gather some of these leaders to talk about their visions. Moderated by Charlotte Talks' Mike Collins and Qcitymetro's Glenn Burkins.